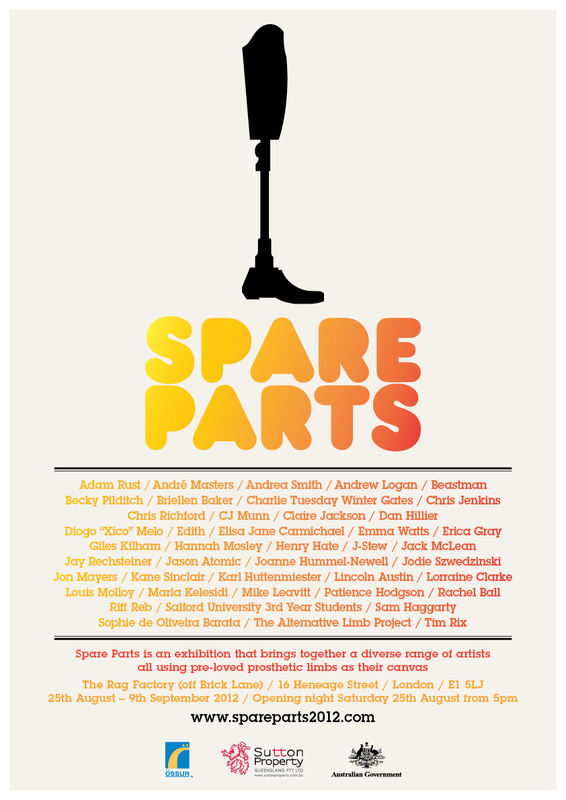 Spare Parts is an exhibition that brings together a diverse range of artists using pre-loved prosthetics as their canvas. The exhibition runs from Saturday 25th August – Sunday 9th September 2012. It will be open from 10am – 7pm daily. Entry is FREE. OPENING NIGHT is Saturday 25th August 2012, from 5pm. The venue is The Rag Factory (E1 5LJ), which is just off Brick Lane in East London. It is very close to public transport, and awesome curry. The Rag Factory is 100% accessible for wheelies.More information will be added to this event over coming weeks. To read more about the exhibition, friend us on Facebook, follow us on Twitter, and subscribe to our RSS feed on the website! This entry was posted on 02/08/2012 by Creatabot in Creative and Art Events, Creative and Art News and tagged art, art news, art news Kent, art zine, artist, brick lane, craft, crafts, creatabot, Creatabot zine, creatarbot, creatbot, createbot, creative, creative magazine, creative website, creative webzine, creative zine, creatorbot, Gallery, help creatives, help for artists, indie, indie art, indie magazine, indie zine, Inspiration, Medway, news Kent, online art magazine, online art magazine Kent, online art magazine UK, online creative, online creative magazine, online magazine, promote artists, prosthetic art, prosthetics, studio, support artists, support creatives, webzine, zine.